Project Diva X - "Elegant Medley ~Glossy Mixture~"
Project Diva X - "Cool Medley ~Cyber Rock Jam~"
Project Diva X - "Ending Medley - Ultimate Exquisite Rampage"
yêu thích song from 1st Encore for Project Diva Future Tone? yêu thích song from 2nd Encore for Project Diva Future Tone? yêu thích song from 3rd Encore for Project Diva Future Tone? yêu thích song from Extra Encore for Project Diva Future Tone? yêu thích extra song from Project Diva F? 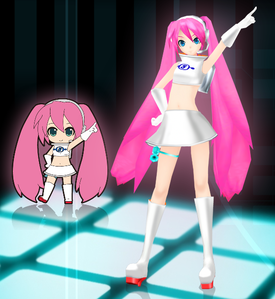 Do bạn wish Project DIVA (along with the upcoming Project MIRAI) could be released in America? Do bạn wish to play Project DIVA? bạn will soon have virtual divas popping off your TV! Famitsu Magazine has confirmed that the Hatsune Miku Dreamy Theater 2nd supports stereoscopic 3D. For those new to the Miku universe – Dreamy Theater 2nd is a PS3 application that connects to the PSP to allow Project Diva 2nd to be played in HD and on the bigger screen. If bạn were lucky to afford the massive Hori controller – bạn just scored yourself a “better than arcade” experience. For the 3D effect, SEGA is promising that you’ll be able to adjust level of depth on a song-by-song basis. Sega announced it will be releasing giáng sinh module add-ons for the 「Hatsune Miku – Project DIVA 2nd」 PSP rhythm game. Miku, Rin, Len, Luka, KAITO, and MEIKO will all have one made available for them — priced at 300 JPY each; hoặc 1200 JPY for the whole set. It is scheduled to be out on November 30th at the Japanese Playstation Store. In addition, Sega will also release the new giáng sinh modules for 「Project DIVA Arcade」 — available November 30th. Recently SEGA has announced of a add-on known as "Hatsune Miku Append Module" for the PSP game "Hatsune Miku -Project DIVA- 2nd", which was made available on PSN (Playstation Network) Nhật Bản Store. Project DIVA Arcade English Site. If bạn order the game, this page will help if bạn have trouble with the Japanese. Anything bạn need to know about the Arcade game. a poll đã được thêm vào: yêu thích song from Extra Encore for Project Diva Future Tone? a poll đã được thêm vào: yêu thích song from 3rd Encore for Project Diva Future Tone? a poll đã được thêm vào: yêu thích song from 2nd Encore for Project Diva Future Tone? a poll đã được thêm vào: yêu thích song from 1st Encore for Project Diva Future Tone? a comment was made to the poll: yêu thích extra song from Project Diva F 2nd? Which game is this module originally from?